One of the best hostels I ever did! It was way better than my expectations. Character, friendly staff, best mojitos, clean room and bathroom, very nice and original interior design. The best hostel in Sevilla if you ask me! This is one of, if not the, best hostels I've ever stayed in. The rooms were clean, well-designed, and spacious for a hostel. The rooftop is simply amazing. La Banda does a great job of putting together activities for their guests, and I appreciated that they weren't aimed solely at the 20 y.o. American studying abroad. It was a fun and fantastic atmosphere for travelers both in their early 20s and early 30s. La Banda Hostel is probably the best hostel I have stayed in thus far. From the moment I checked in they went above and beyond with friendliness and attention. They do a great job of creating ways for people to meet and connect while also being a part of the culture there. The location is excellent and the overall atmosphere just makes you feel like you are amongst friends. I liked it so much I extended my stay! I highly suggest you join the La Banda family. The staff here at La Banda is great. They make you feel so welcomed and the rooftop is a great place to meet new people. One of the best hostels I've stayed at. Staff is super friendly and helpful. 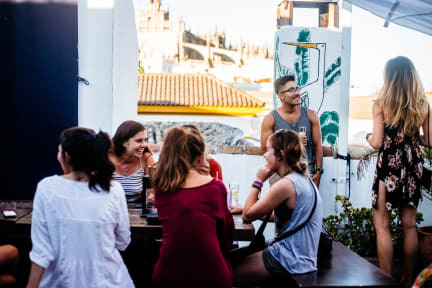 Rooftop terrace with a bar is a great way to meet other fellow traveller's and is a starting point for pub crawls that are organized almost every night if there are enough people. Beds are comfortable and showers are bigger than in most hostels. Location is superb! This is by far the best hostel experience I’ve ever had. The staff was incredibly friendly and helped to create a comfortable and fun atmosphere. The rooftop bar was a blessing, be sure to take advantage of happy hour and hostel dinners! Everyone staying in my room was very friendly and I almost wish I had been traveling alone here so I could have hung out with them all more. The location is pretty central but there’s a good amount of walking to get most places. Overall, YES, book it! Great atmosphere and rooftop is very nice. Staff at the front desk are very helpful if you need anything. Only things that weren’t great were that our room (8 beds) got super super hot at night (in March) which made it hard to sleep. And there appeared to be only 1 female bathroom that the whole floor used. Great stay overall though! A good quality hostel with an awesome rooftop view. The location is perfect and the staff are very friendly, although the price is a little higher as compared to others. The worst thing about the hostel are the showers/toilets; small and not enough room to change (quite communal). Aside from this, the rooms are good enough, there’s free coffee, good WiFi and it holds a friendly atmosphere. Would recommend. Cool hostel with a really nice Terrace. Super friendly and informed staff. Breakfast will run you 3 Euros, but coffee/tea and some fruit are free and available all day. The hostel arranged dinner you could sign up for (6 Euro) was very tasty and created a social atmosphere. The rooms have sturdy beds with curtains for privacy. The downstairs area is very relaxing too spend time in and recharge. Also good location for exploring the city.